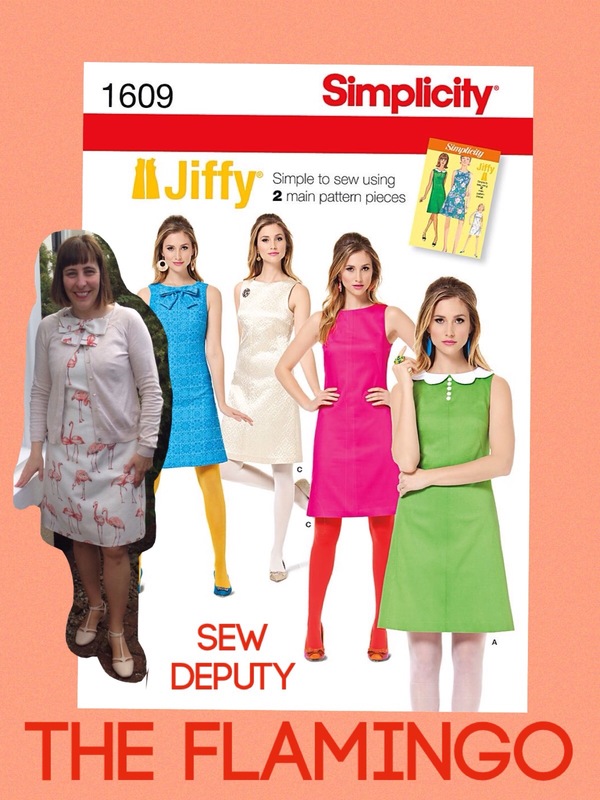 I keep on sewing the Simplicity Jiffy 1609 as I love the fit and when I have some gorgeous fabric that needs to be shown off…it’s perfect! I am really pleased I live fairly close to The Sew Cafe and it’s now becoming a little habit to call in on my way to the Metro Centre (our closest shopping centre) in the holidays. Jean, the owner, has an expert eye for beautiful fabric. So when I went to visit in May half term this was what I purchased. 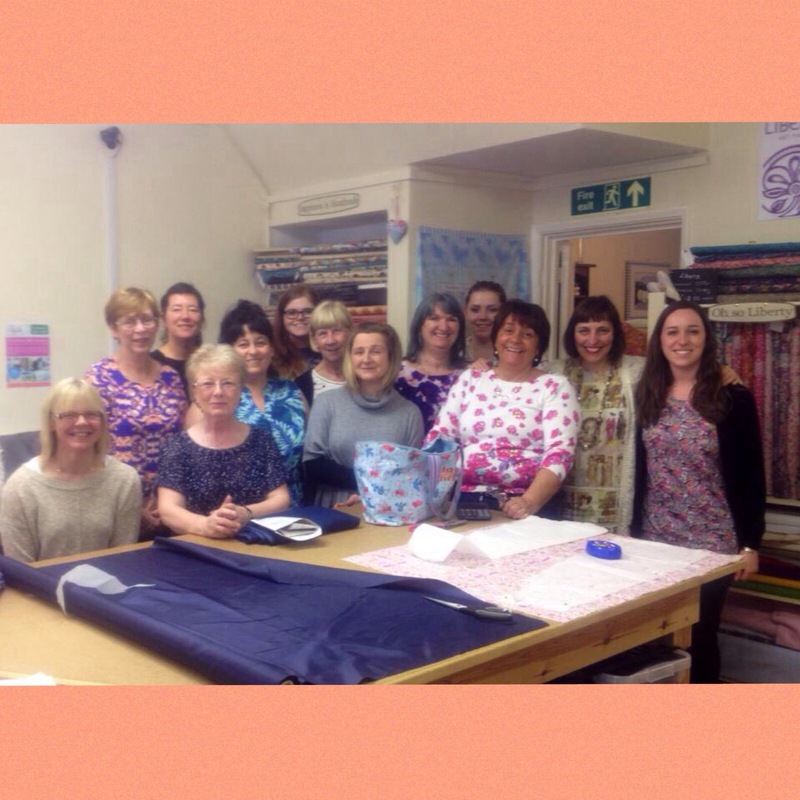 There was a sewing class on so I had a good look at what they were all up to for inspiration! 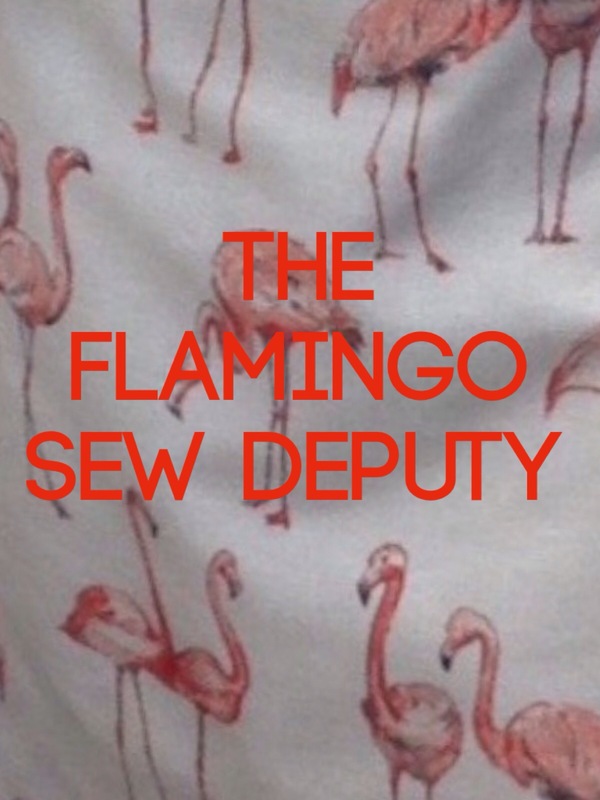 Jean’s daughter was sewing the flamingo fabric into some cushions for her deckchairs, so I think I may need to go for a barbecue and blend in!!! 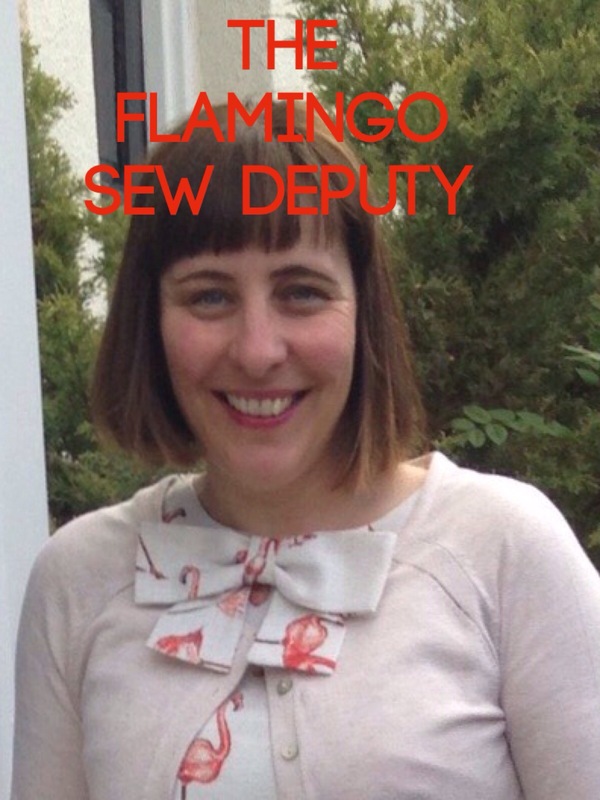 I did have a coral cardigan to wear with it but it really took away the impact of the flamingoes. It is a gorgeous fabric to wear and it feels like my Sunday best! 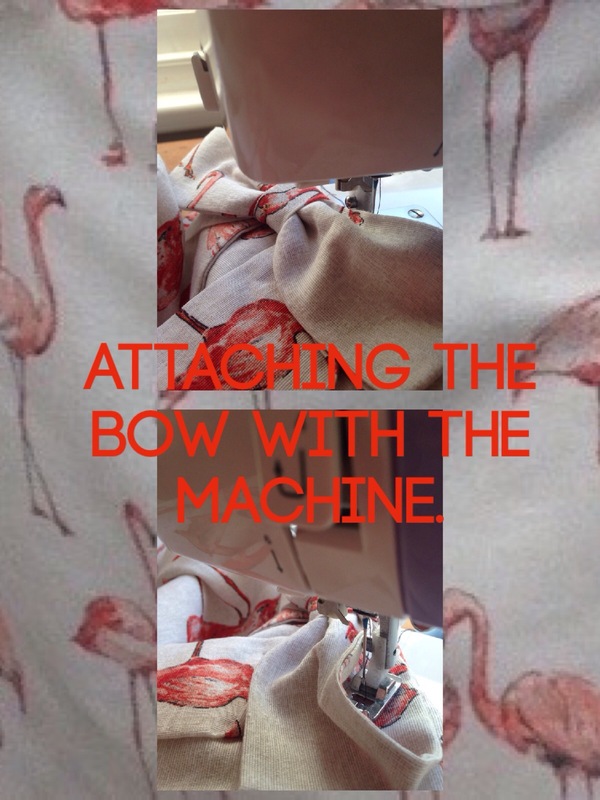 I always sew my bow on with my sewing machine as they can very easily detach with my hand stitching! Here is how I do it…I pin it on where I want it to be and then just do some stitching inside. I used interfacing in this bow as once my dresses have been washed the bows seem to go quite flimsy. I used a light weight interfacing so hopefully this will work well, if it is too heavy the bows are too rigid. I think this is a great pattern and I love to see what my fellow 1609 enthusiast Emma Jayne at Clipped Curves creates, she has just made a great version covered in glasses. Wonky Factor: 10/10 I ❤️ it! This pattern one of my faves too – in fact it’s been calling to me ever since I bought some fab lobster fabric a couple of weeks ago! 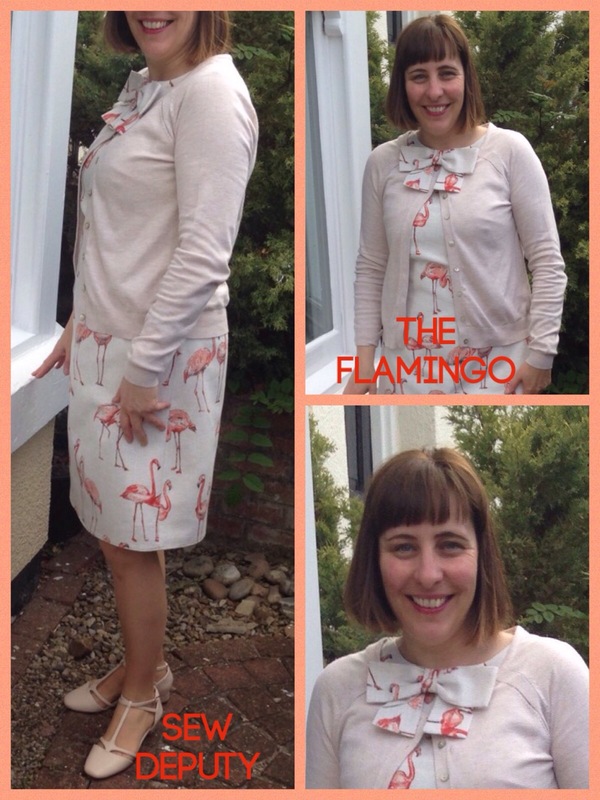 Love the flamingos – they give the dress a retro feel. Thanks for the bow tip I’m going to try this next time! Oh have you got the lobster sandals too?? I keep seeing them on blog posts. Dolly Clackett for sure… She has a dress too!!! I reckon it would look just as fab with the coral coloured cardi! Have you thought of trying organza in the bow instead of interfacing? Yes, but I didn’t have any and the local store has the polyester type make. I need to buy some. 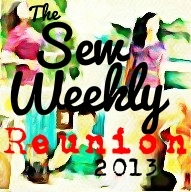 Do you sew it onto the fabric first? I always imaging it rolling about inside! I usually invisible-stitch it to the inside to make sure it doesn’t move. I find it works better than anything else for this type of thing. Thanks ! Will try it! Haha, I know!! It could be very extreme!!!! Another great version Amanda! Flamingo’s are so fun. Thanks for the mention, I think my next one will be in the autumn… I have a very autumnal leaf print that could work well for this pattern with tights and boots. Well, I have some beautiful fabrics in my stash that would be perfect to show off in this style!! Haha! I also am thinking they would be gorgeous in corduroy for school for autumn!?!?!? Well, if it’s not broke, why fix it? 😉 Another great version of this dress Amanda. Your bows always look perfect! Oh, my – shades of Florida Everglades & racetracks (Flamingo Stakes race)! What an ab-fab dress – your students will adore it! Such a lovely dress, Amanda! Love the flamingos! Thanks! I knew you would like it Tanya! Interesting fabric, it makes such a statement. Thanks! It feels really posh!! Love that fabric. I really want to see the deck chairs now! Hehehe! Bet they are fab! looks fabulous! I made this pattern in tarten at Christmas and want to make another now in a fun cotton for summer! Yes! Me too! Hahaha I added a lace trim to mine! I fancy a corduroy one for autumn???? Take your cardi off!!! The dress looks fab. You were always a bit if a posh bird Amanda 🐝! Hahaha, I love my cardi Nee! I needed to go to Flamingo land! I went there in primary school! Flippin’ ek that was an age ago! That is very cool fabric – good thing you showed it off! Lovely dress!